Wallpaper has gained in popularity over the last few years. More modern than what you may remember from your grandparents home and used by designers in a different way than in the past. Wallpaper is used more selectively today. Wallpaper now adds personality and style without being overpowering. Social media has played a big part in the comeback of wallpaper. Designers are posting their projects on Pinterest, Houzz, and Instagram making us less afraid to use wallpaper in our designs. In the past designers would cover every wall with a variety of wallcoverings which would become overwhelming. 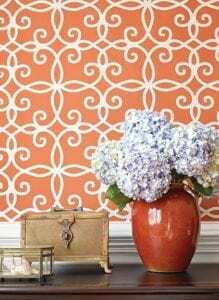 The more modern approach is to use wallpaper to accent a single room like a powder room, laundry room or foyer. Also an accent wall in any room particularly the master bedroom is a popular choice. There is such a vast array of patterns, textures and styles which makes wallpaper the perfect finishing touch for any room. Palm Beach Fabrics carries all of the top brands of designer wallpaper. Come visit us in our showroom in Juno Beach to see all of the latest styles!